The concept of “regulatory freedom” may mean different things to different people. For passengers, the freedom to have options, in terms of various types of service and fares, with no inequities and greater efficiency is paramount. When it comes to transportation equity and accessibility, some consider this to be the civil rights movement of our time. As more and more people are moving to cities, living longer and wishing to reside in urban environments to enjoy their golden years, the transportation access issue becomes even more critical. Also, reduced driver income, the proliferation of transportation deserts and underserved communities continue to be important and evolving issues in the equity sphere. From a regulator’s standpoint, with the Transportation Network Company (TNC) movement having run its initial course, there is now some freedom from political pressures exerted on regulators, who may now pick-up the pieces following the casualties of disruption. Finally, for the incumbent taxicab and limousine industries, key decisions are being made on whether to lobby for the elimination of regulations that tie their hands from competing. Please Note: Associate or industry members will not be able to register for the conference unless they sponsor at a silver level or higher, or sponsor any a la carte item with one full non-discounted registration and associate membership for 2018. First time attendees to the conference can attend without sponsoring upon approval by IATR. The theme for Day 1 will be "Smart Urban Mobility - Technology, Shared Mobility and Mobility as a Service (MaaS)." Experts in the field will discuss how cities and countries around the world are dedicating resources to multi-modal integration, collaboration and coordination. There will be an emphasis on "Smart Cities," the use of transportation data for policymaking and service delivery, and how technology can be used to leverage seamless connections between public and private transport modes, as well as to encourage first-and-last mile solutions and shared rides. This day will also include a policy-oriented workshop session on automated and connected vehicles. Unlike panels in the past that focused on the progress and application of new technologies, this interactive session will dig down deep into how such technology and its implementation will impact issues for both transportation regulators and their regulated industries, including an interactive focus on: regulatory governance (who regulates and what? ); safety (testing protocols and the "hand-off" back to passenger control); data privacy and cyber-security (preventing hacking); insurance (end of auto liability and new forms of insurance? ); labor displacement (will taxi drivers disappear? 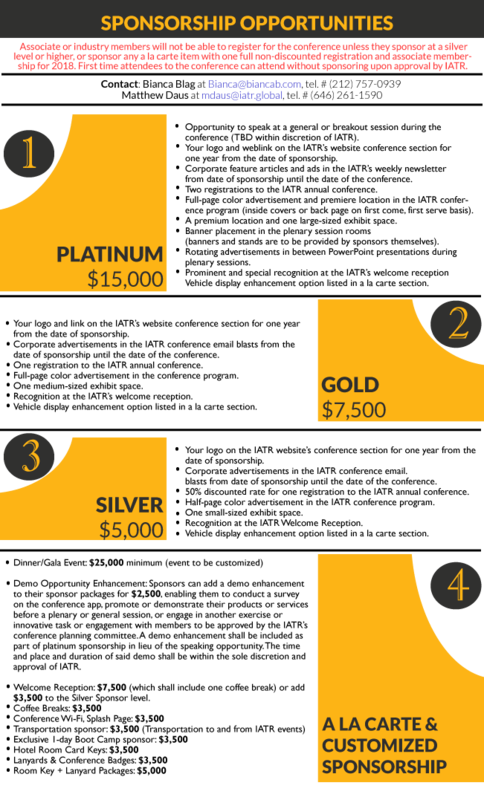 ); and the impact on sustainability, equity and wheelchair accessibility. There will also be a first-ever "War Games"session involving "Data Mining"- where TransAd, the regulatory agency from Abu Dhabi, United Arab Emirates, will be showcasing the unique work of their data mining department, and how taxi and other transport data is analyzed to help shape policy and regulatory management. This interactive session will include real-life policymaking or "war game exercises," where attendees are put in the driver's seat to solve transportation policy problems using the data sets available. The theme of Day 2, consistent with our historical presence in Philadelphia, will be "Transportation Equity." Sessions will include the finalists for the "Accessible Transportation Solutions Data Challenge" (a "hack-a-thon" over an extended timeframe of several weeks) where the IATR data commons will be used by students and researchers to develop solutions to specific challenge questions through the work of the IATR's technology / innovation and accessibility committees. Sessions will be held on how new service models, technology and policy will impact the reduction of transportation deserts, increase service to underserved communities (and rural transportation), as well as the impact of the changing for-hire market on driver earnings and wages. Sessions and workshops on the use of demand-responsive transit for public paratransit will take place, along with sessions involving a review of wheelchair accessible vehicles (WAVs) and designing the "WAV of Tomorrow." Finally, our last day will focus on safety. The sessions will focus on the best way to regulate and promote public safety in a de-regulated or self-regulated TNC era (such as third-party validation), the latest developments in Vision Zero policymaking, new technologies for preventing driver fatigue, as well as black box and telematics initiatives to track driving behavior. The topic of workers' compensation and other insurance models and funds to protect passengers, pedestrians and drivers will be discussed. Of course, there will be more cutting-edge keynote speakers, IATR committee meetings will be held, and members from many transportation and educational organizations from our Advisory Board, will be on full display. 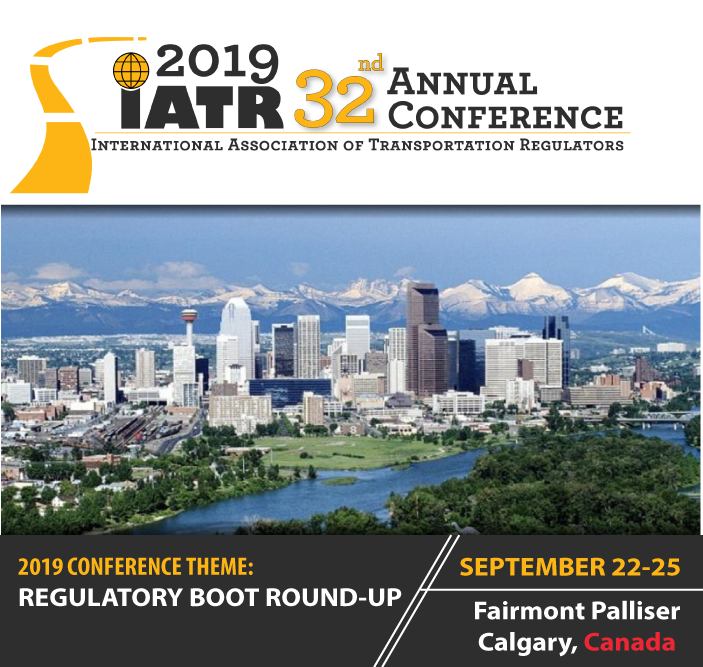 We hope everyone will sponsor early, register early, and participate, as we enter a new phase of our regulatory life for the next 30 years of IATR's existence. It is time for IATR to hold its own regulatory "Constitutional Convention," where we revisit what we do, why we do it, and how we can do it better - working together under a new paradigm, and charting a new course for our future. Back by popular demand, the Austin Inaugural Boot Camp Training is back for an all-day training session in Philly on Friday, September 14th. Topics will include regulatory basics, but also workshops on specialized topics, including an introduction to shared mobility, Mobility-As-A-Service (MAAS), as well as automated and connected vehicles.